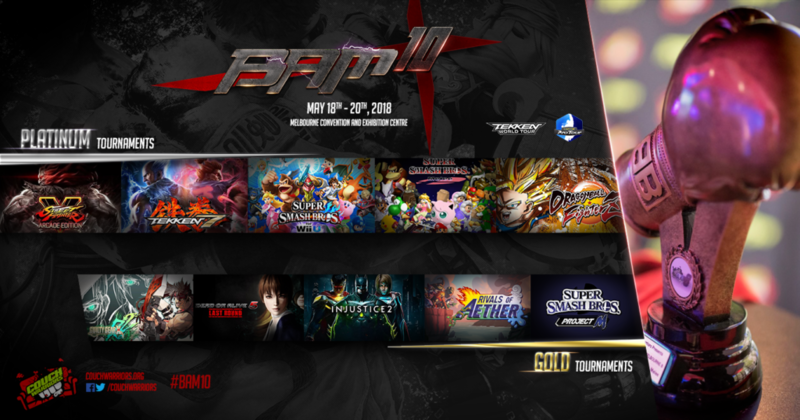 #BAM10 is the exciting culmination of a decade of community love, effort and hype! 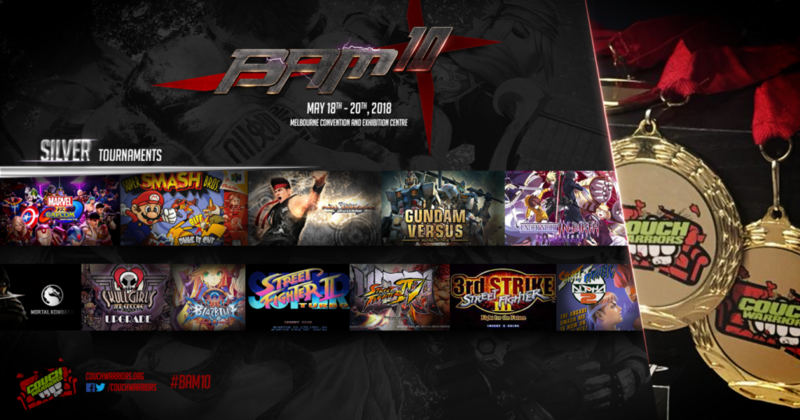 Australia’s largest fighting game major, Battle Arena Melbourne (#BAM10) returns to the world class Melbourne Convention and Exhibition Centre on the 18th-20th of May 2018 to celebrate 10 years of incredible national and international fighting game competition. Registration for all Platinum level tournaments and Smash titles ends May 13th! Cosplay competition details to be announced, requires a Spectator pass. You will be required to go to the Registration and Information desk, and speak with our Tournament Official’s (TO’s) at 4:00 PM to pick up your passes (competitor or spectator) to have access into the Tournament Area. You are able to sign in and pick up your pass at any time over the weekend, just please account for the large amount of pass pickup’s on the Friday. If you don’t have a pass, then security will not let you into the tournament area. Please ensure you have your pass visible at all times. You will need to show a valid form of ID (PayPal Receipt / Smash.GG Account / License) when speaking with the TO’s to pick up your pass. Once you have your pass, you will be free to play casuals or when scheduled, play your scheduled matches. Trophy and Premium Stage Feature Titles. 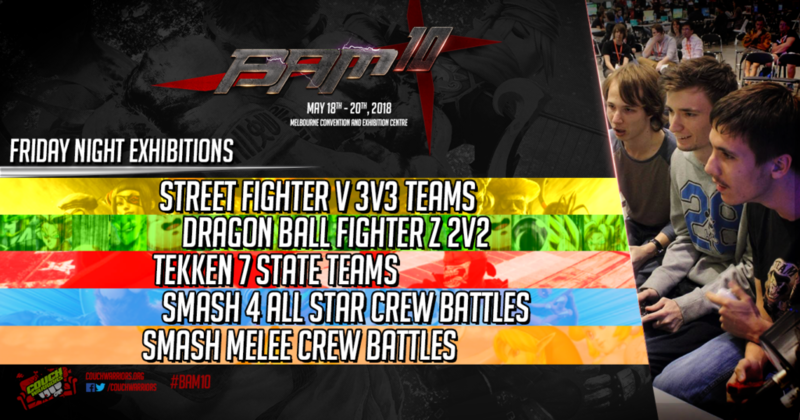 – Friday Night Exhibitions: SFV 3v3 Teams, Tekken State Teams, Dragon Ball Fighter 2v2, Smash 4 All Star Crew Battles, Smash Melee Crew Battles. Melbourne Convention and Entertainment Center is located close to both Southern Cross and Flinders Street Stations. If approaching from Southern Cross station, the venue is a short 11 minute walk away. In addition to this, you can also take either the 96, 12 or 109 Tram, which stops close to the venue. If approaching via Flinders street, its a 15 minute walk via the yarra promenade. You can also take either the 35,70 or 75 Tram and then walk a short distance to the Melbourne Convention and Entertainment Center. If you are driving in, there is parking both available at Crown Casino as well as South Wharf – DFO. Parking in both of these area’s is paid, so you will need to observe the relevant requirements. Most Importantly, Good Luck and Have Fun!